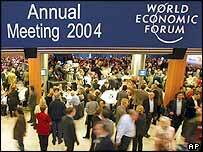 So what makes the World Economic Forum and Davos so special? BBC News Online is on the trail of Davos man. Some habits die hard. 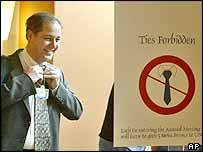 Davos man has been told to lose his tie - on penalty of five Swiss Francs, payable to Unicef - but at the meeting of the great and the powerful in Davos there are still plenty of ties in evidence. "Oh, I didn't know there is a no-tie rule," says Peter Sutherland, the former boss of the World Trade Organisation and now a top investment banker at Goldman Sachs. "I'll come without one tomorrow." Others are unabashed. "I just feel more comfortable with a tie," says Dietmar Kuhnt, chairman of Europe's largest energy and water company RWE. And anyway, does taking off your tie really make a difference to Davos man? Not really, all agree. "At least it lets much more blood flow to your brain," jokes Robert Bellhouse, a top telecoms executive, who runs a disaster relief organisation in his spare time. And so they walk around - tie or no tie - to do what Davos man does best: Networking and schmoozing. The crowded corridors and halls of Davos' perplexing conference hall have an ant heap feel about them. Everybody is bustling about, small clusters form briefly, only to break up again as participants drift from friend to acquaintance on to someone new who could be even more interesting. Name badges, dangling from all too short elasticated bands, are obligatory, and are eagerly peered at to check out whether the other person is worth talking to. Mobile phones are ringing constantly. Keyboards are tapped furiously as Davos men and women crowd the rows of computers nestling along most walls, sending e-mails to other participants, hoping to make contact in this bustle. There is backslapping of friends. There are groups of twos or threes or more, engaged in intense discussions about the debate just heard. And there is the ultimate tool of networking - the business card. Once Davos is over, there must be 2,000 people putting in orders for a fresh supply of business cards. Walking the corridors and streets of Davos induces a constant feeling of deja vu. 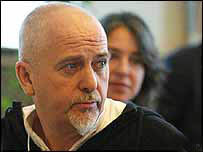 Isn't that Peter Gabriel over there? Over there, isn't that what's his name? And there, coming out of the conference room, don't I know that face? Oops, now we nearly bumped into President Musharraf. There, stepping to the side in the narrow corridor is Israel's ex-prime minister Ehud Barak. George Soros walks past in deep conversation, I think that over there is Peter Gabriel and didn't I see that man over there last week on business television? But this is not just about meeting friends and rubbing shoulders with famous or influential people. The five days of Davos are packed with discussions and workshops about everything, from "how to be hip" to "is there light at the end of the eurozone tunnel" to "partnering against poverty". The dialogue at these meetings is surprisingly frank. And where else but in Davos can you hear a discussion about China's economic future, and the Chinese official in the know just happens to be in the audience and speaks up to set the record straight. A question bugs you? The answer is always close. Let's say you wonder whether the US economy is really set for a long-term recovery. Ah, there is Lawrence Summers, ex-Treasury Secretary under Bill Clinton and now Harvard president. Let's step up and ask him for his opinion. And so Davos men and women meander between the serious and the frivolous, between the networking and the schmoozing. And in the evenings, they engage in Davos' favourite sport - party hopping. But even here it is all about touching base with old friends and seeing the right people. But let's go back to the conference centre, and what's this? The room is suddenly full of people with ties. Ah, well, they've all got little earpieces and slightly bulging jackets. The security team for a truly important person has arrived. Now is he wearing a tie too?